I hope that everyone has a safe and happy holiday... and is looking forward to the new year. I suppose that my orchid thinks that showing its cheery, smiling face is going to make me forget that it opened a whole day late. This tardiness, in spite of my constant reminders for the past few weeks that it had to be open by the 15th for December's Bloom Day, makes me say: "Harumpf!" On the other hand, I just flat-out missed the blooms on this rosemary. 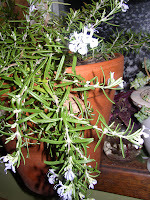 It was behind another pot of rosemary on the kitchen counter, and since the branches all cascade down they were hidden from view. This may be the last year that I bring rosemary inside, by the way, as I learned that one of my garden center co-workers has successfully overwintered hers outside for the past 5 years. 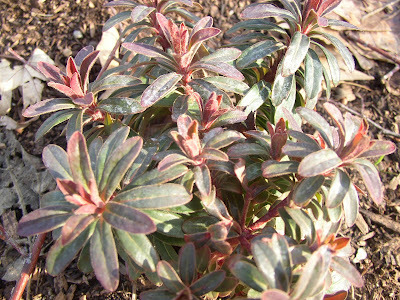 They are now shrubs--I will definitely have to try that! The flowers on 'Huntington Carpet' are actually a very pretty light blue, but I had to use my flash because the picture kept turning out yellow without it. That's the one thing I hate this time of the year--I'm so busy at work, and the sun rises so late and sets so early, that I rarely get enough daylight at home. But next month will be better. It's Garden Bloggers' Bloom Day, and I am cheating. Sure, I have a cute little poinsettia on my dining room table--in spite of the fact that I don't like poinsettias--but frankly I'm not in a very Christmas-y mood right now so I don't particularly want to show it. Bah, humbug! 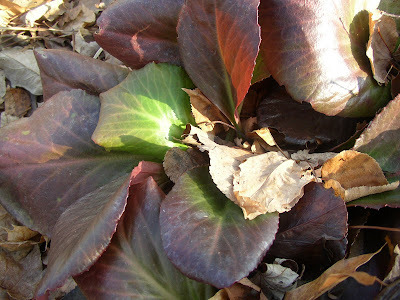 What I want to show off instead is the lovely bergenia from my front yard, which is starting to "bloom" with tinges of its winter burgundy. 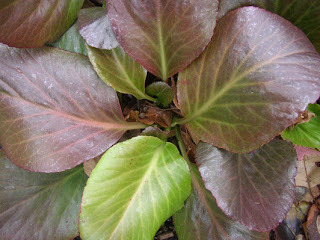 In his book "Christopher Lloyd's Garden Flowers," the late Christo voiced his suspicion of the worthiness of bergenia... but did include a mention of its virtues as listed by fellow gardener Beth Chatto, who loves the plant and has included it in her dry gardens. I agree with both of them in context. The flowers are not really worth growing the plant for... but the plant itself is so handsome and dependable that it definitely deserves a spot in the garden. 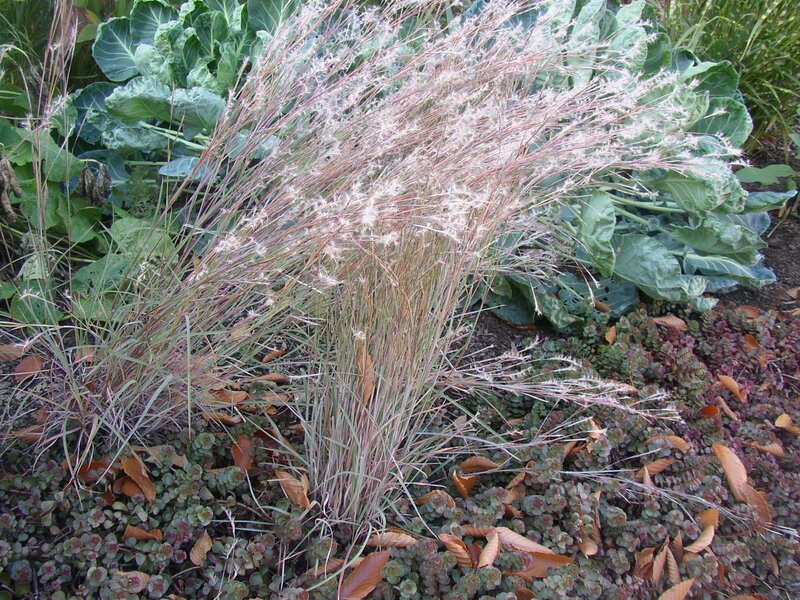 Especially since it takes on this coloring from fall through spring, when not much else is changing in the garden. 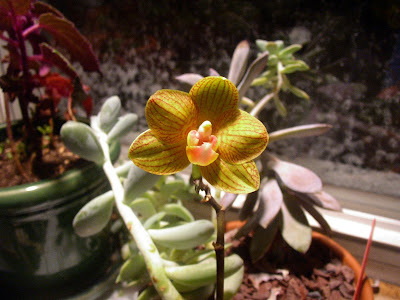 Since Bloom Day is all about flowers, I suppose that I should take a picture of the big, fat, swelling flower bud on my phalaenopsis orchid to post... but if I much prefer the approach of my fall-planted 'Angelina' sedum. You can see a hint of the dark orange that her tips will be turning soon, and the rest of her looks beautiful in the meantime. In comparison, the orchid bud sits there like an oyster shell, clamped shut and stubbornly unbudging. It's been like that for way too long--doesn't it know that more isn't always better, especially in regards to teasing? Sometimes you at least need a taste of the beauty that awaits you. 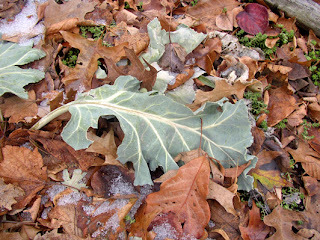 I never realized how beautiful the dusty blue leaves of sea kale, crambe maritima, could be in the wintertime... because by this time last year, the leaves had all withered away. 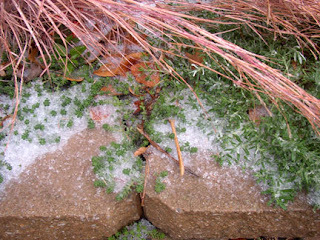 I like the way they combine with the pebbly snow, brown leaves, and green sedum. The muted but rich colors, and the layering here, is very interesting. 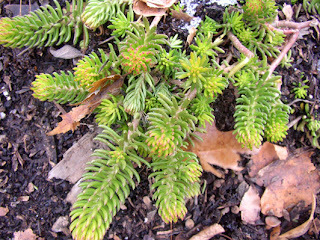 The sedum is one that I had at my old house and have been introducing to fill that area while the sea kale is dormant--last year, there was a huge bare spot there from November through March. The sedum is a polite spreader, and isn't bothered by the shade of the sea kale leaves, so the plan has been working out fairly well. "You know, there's a million fine looking women in the world, dude. But they don't all bring you lasagna at work. Most of 'em just cheat on you." Garden Journal note: 2007 planting completed at 12:13am on Thursday, December 13. Yes, you read that correctly... I finished this year's planting after midnight last night. My boyfriend pulled up after his fencing lessons (he gives them) and found the dog and I working in the backyard. 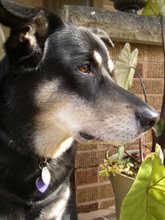 She was sniffing random tufts of grass--investigating who had been in the backyard leaving her messages, no doubt--and I was digging in the dirt with my favorite, broken old shovel. 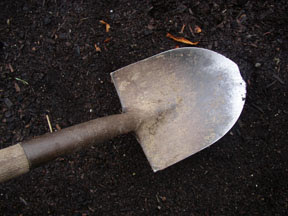 Whenever I'm out digging at an absurd time of the year, I always think about those "Fall is for Planting!" 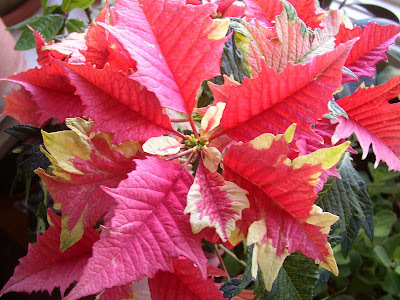 proclamations that decorate garden centers at the end of the summer. I chuckle to myself and think, "No, December is for Planting!" I had two silene maritima that I had dug up but never replanted, and two pots of a low-growing blue sedum that were in the same boat. 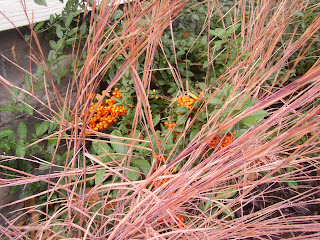 And when I recently visited the garden center where I worked this spring, I was gifted some free pots of perennials. Sure, they were frozen and felt like chunks of ice so they might not make it through the winter... but then again, they just might. I sunk them all into the ground, pots and all, to insulate their roots and wished them well over the coming winter. 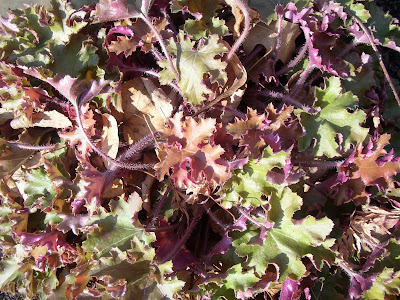 Having a small garden, I am pretty choosy about the plants that I bring home--free or otherwise. So when offered a few plants, I sifted through what was left on the tables and picked only those plants that I had considered buying this year anyway: A yellow spiderwort (for container planting), a silver lungwort, 2 hostas, and 3 small pots of bearberry. 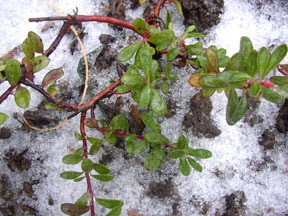 Besides being a pretty, low-growing, tough little plant, bearberry has an interesting history. First noted in a 13th century Welsh herbal--which appeals to my Welsh heritage--it was also used by the Native Americans as a smudge and for various herbal remedies. 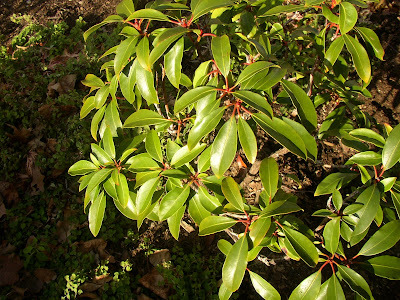 It gets its other common name from its use in a Native American tobacco mix... and it's already set as that in my head because it's so much fun to say that you have "Kinnikinnick" planted in your garden! 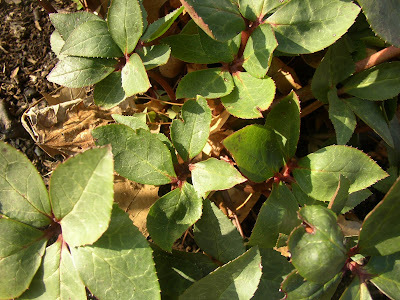 Trout lilies, cool foliage plants, and a tiny little plant with lots of history. If those aren't good enough reasons for me to be out planting in 30 degree weather, consider this: The pictures accompanying this post were taken early this morning, as freezing rain started to coat NE Ohio. 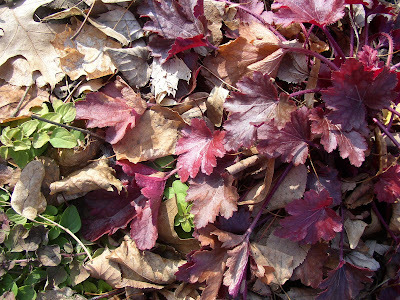 (Doesn't it look like some kind of pretty, modern, glass mulch?) Temperatures are supposed to plummet into the low 20s and upper teens during the overnights starting tomorrow, so it really was a now-or-never issue of getting them dug in before the ground froze. And now that I'm finally finished with my outdoor planting for the season, just a week or so before the solstice... well, winter can finally head our way! Houseplants: 2 pots of sanseveria, a huge spider plant, my clearance-find crown-of-thorns, 2 pots of cacti, 5 pots of sedum and various other succulents, a dark-leaf rubber tree, an aloe that's barely limping along (that's a genetic deficit, not being able to grow aloe,) a philodendron, a draceana, a lucky bamboo, a purple passion plant, one orchid, a variegated ivy, a small Christmas cactus grown from cuttings, and two jade plants--"The Monster" jade plant (that I just had to replant into a 14 inch pot!) and its much smaller counterpart. Herbs, tender perennials and overwintering annuals: 1 licorice plant, 2 different silver plectranthus in the same pot, 2 'Cerveza 'N Lime' plectranthus, 2 different begonias, 2 bay laurels (in their third year) with silver ponyfoot planted around them, phyllostachys nigra (black bamboo,) a 'Golden Delicious' pineapple sage cutting, 'Sweet Caroline Bronze' sweet potato vine, 4 kinds of coleus, one 'Red Sensation' cordyline, 'Gage's Shadow' perilla, and 4 pots of rosemary. YIKES! When all of the above were added up, I realized that I had 45 different plants to keep alive in my house over the winter. As Heather mentioned, that makes for quite the jungle... but apparently even that was not quite enough to satisfy my insanity. 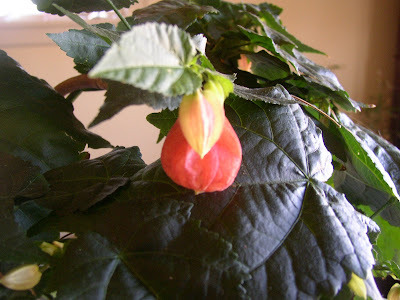 Over the past week I have acquired even more indoor plants on clearance: 3 fancy sempervivums that I planted inside the birdbath bowl that I just brought inside and a gorgeous abutilon megapotanicum (flowering/parlor maple) that had been placed on clearance simply because it was almost out of blooms. But my biggest, most problematic new acquisition... is this. I am not the greatest with houseplants, but I'm pretty sure that this is (was?) 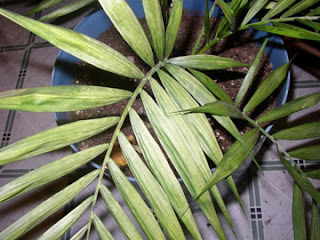 a parlor palm of some sort. I found it this evening a mere 4 doors down from my house, nestled in its 16 inch blue plastic pot under a canopy of wooden pallets and broken lawn chairs. Right next to it was a 20 inch burgundy pot with a broken, brown draceana stem sticking out of it. As a frugal gardener, I can always use more sturdy pots, especially if they are both large and free. So after letting the dog in the house, I went back to retrieve both. The big burgundy pot is sitting on the porch right now (and it has a big seashell in it--bonus!) but there was just enough green on these palm leaves to convince me to bring it inside. I'll post updates on the palm throughout the next few weeks, but I'd love to read some comments if anyone feels like hazarding a guess as to what its ultimate fate will be. 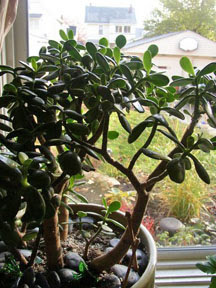 (Advice on how to treat it in "sick bay" is more than welcome, too!) I'm not a fan of Vegas, but I'd like to believe that my odds with this palm are 50-50 unless someone tells me otherwise. And as an optimist, I'm going to round that up and say that I have a good shot and getting something out of the whole experience. Posted in honor of Garden Bloggers' Muse Day, the newspaper and other items that I picked up in the yard, the gusty shower that drove me inside and is now slickening the sidewalks, the leftover steak that the dog is about to eat, and the three beech leaves that I picked off of my shoes once I returned to the house. It took a while to arrive, and it didn't stick around--not for even an entire week--but I did finally get some good fall color this year. 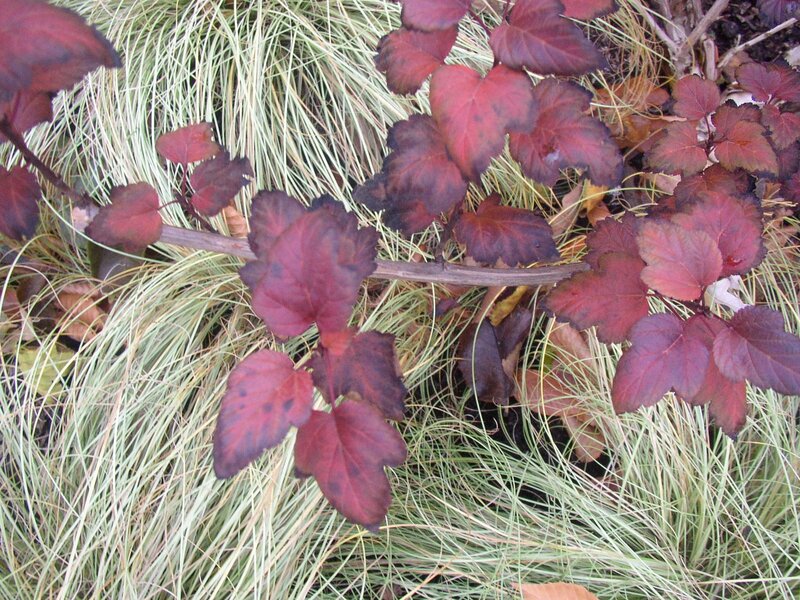 The unexpected star of the late show was this 'Diablo' (aka 'Monlo,' aka "Diabolo') purple ninebark, physocarpus opulifolius. 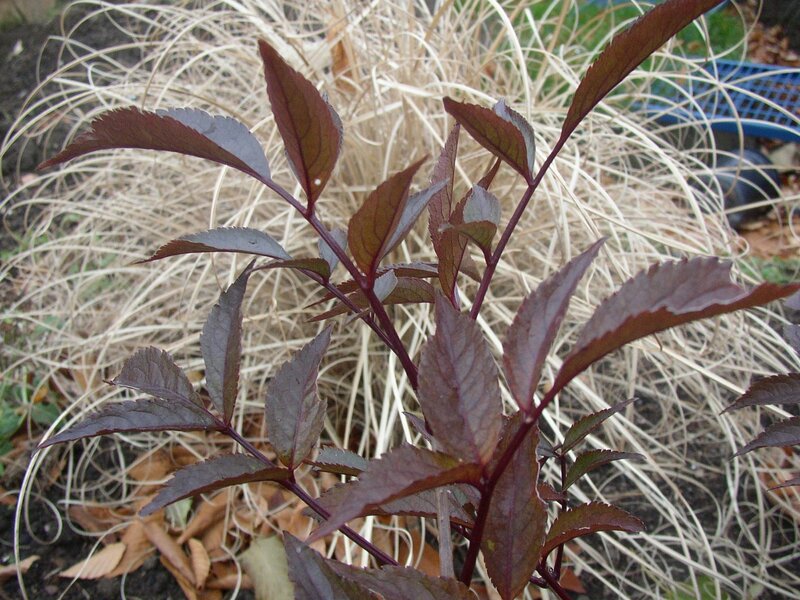 I don't know for sure that its Latin name means that its leaves are showy... but based on the plant's appearance I could easily buy that definition. It's a happy accident how well Diablo's fall leaves play off of the red-stained arbor post, but one that I'm looking forward to enjoying for years to come. Especially when the arbor is finally finished! By the way, some of you who have your own ninebarks may be looking at mine and thinking, "Why are the leaves on her shrub so small?" That was my botanical mystery of the year! When I bought the plant last year its leaves were normal ninebark-sized. This year, I had these delicate tiny things instead. My guess is that our April cold snap came at exactly the right time in the leaf bud development to cause this. Any other theories? 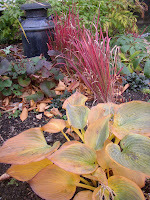 The hostas finally came around as well... mostly. 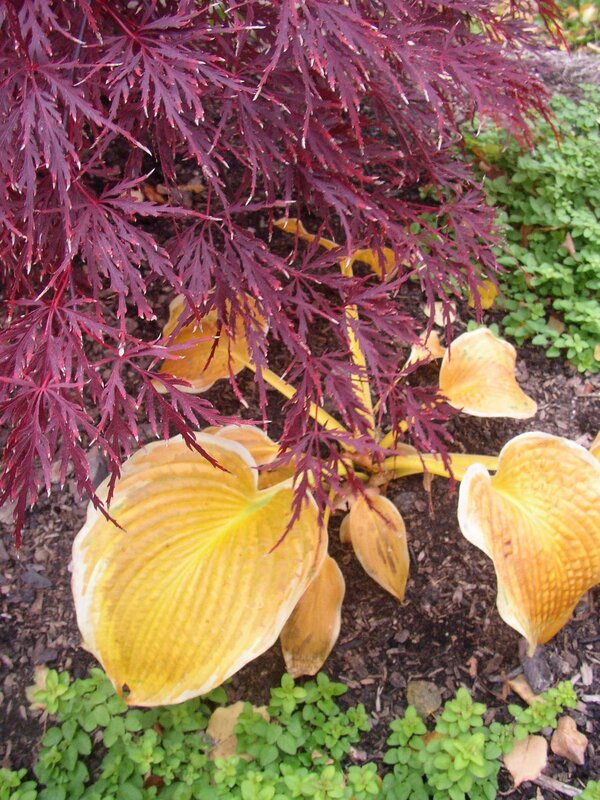 'Northern Halo' added a lot of zing below the slowly-turning Japanese maple, and my unknown blue variety turned a warm golden shade. 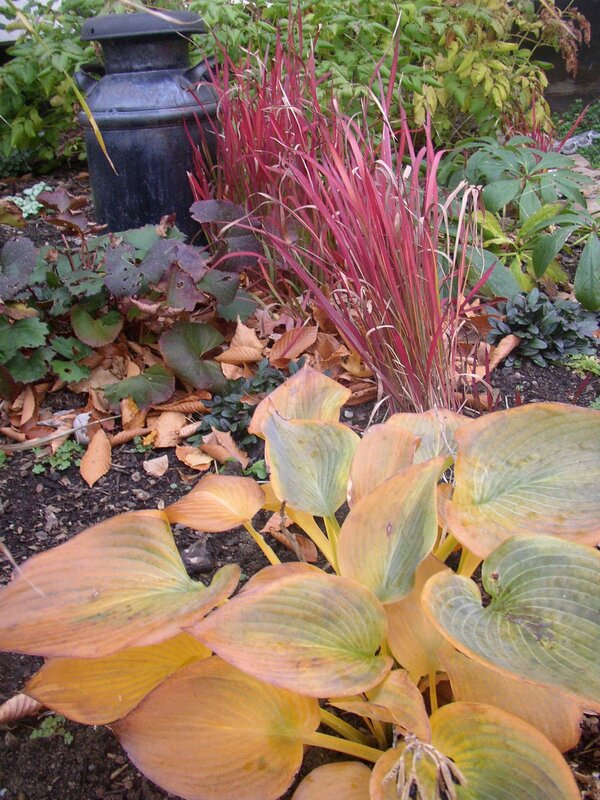 Last year's favorite fall-color hosta, which burned electric in front of some 'Powis Castle' artemisia as seen in this post from October, barely turned any color at all before its leaves bleached out and blew away. While digging up a link to that post, I discovered that most of my fall color last year came in late October, while this year I had to wait until November to enjoy the turning of the foliage. Discoveries like this really make me happy that I have this blog for reference... especially since I can't seem to maintain a proper written garden journal for some reason. And my memory is sometimes a steel trap, and other times a rusty sieve, so I don't particularly like to rely on it! 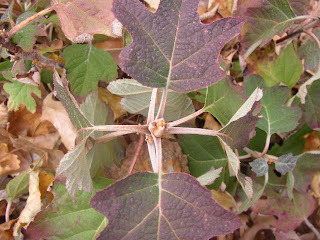 One thing I apparently did remember correctly, however, was the rich autumnal tones of my oakleaf hydrangea last year. I ran outside to take a current picture for comparison, and you can see that the top leaves are starting to get the idea but the rest of the plant is still mostly green. 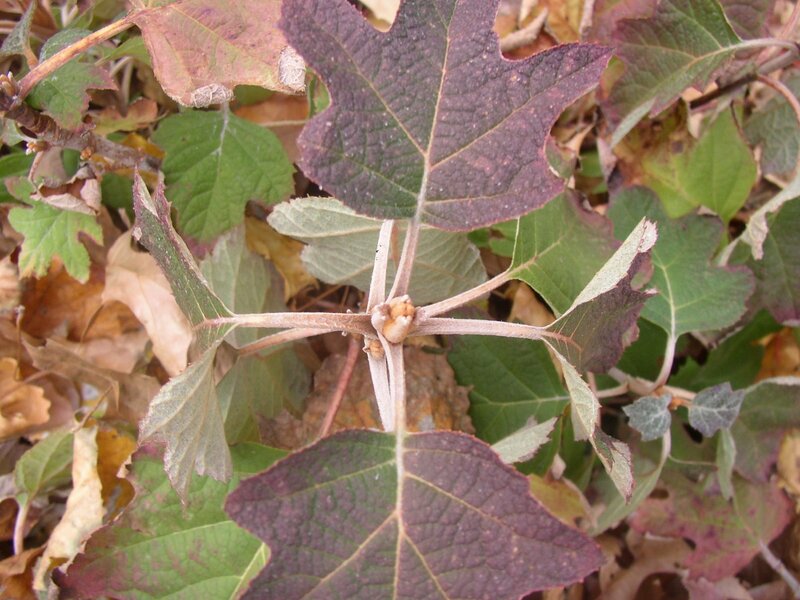 You can also see that the plant is packed all around with leaves from the basswood tree in my treelawn. 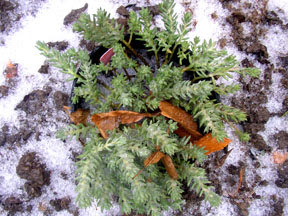 I love the way the leaves seem to "tuck things in," so unless I know that the plant should not have any extra winter mulch (for example, with lavender) I generally leave the plants with their little foot-blankets throughout the winter. 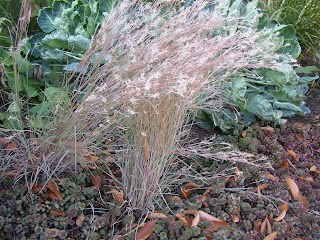 My biggest disappointments in terms of fall color were my grasses. The sorgahstrum nutens began to take on some gold tones but then bleached out quickly. 'Morning Light' miscanthus faded quickly into a straw-esque ghost of its former self, and did nothing to pick up the dark tones of the 'Black Beauty' elder in front of it. 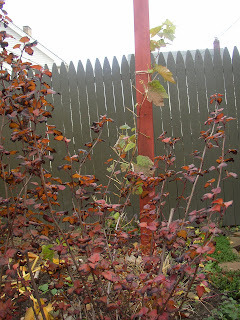 In mid-November, the neighbor's beech leaves were falling but only the seedheads on my little bluestems gave a hint that they realized how late it was in the season. But finally, they turned. 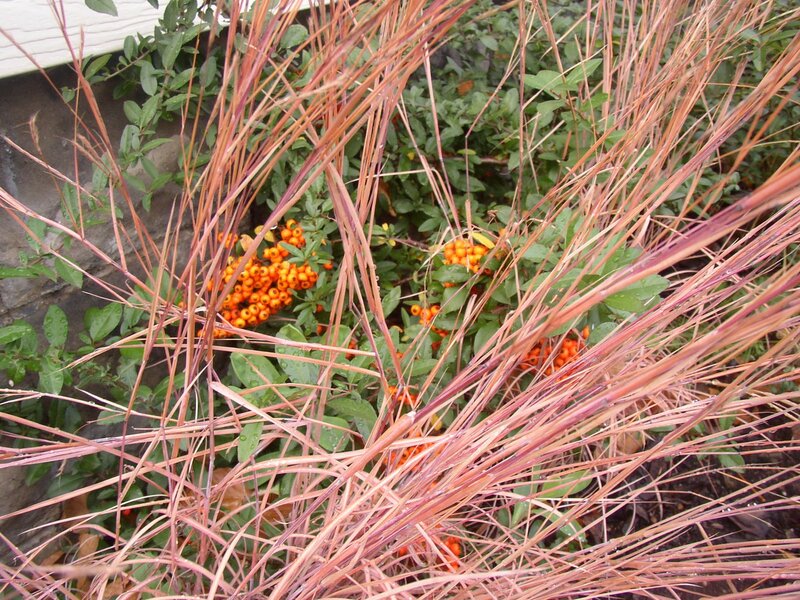 I know that I "shouldn't" like this combination of warm pink foliage and orange pyracantha berries, but I do. The color, the texture, and the unexpectedness of this combination just does something that makes me smile. And with that smile on my face, I'd better end this post and get outside. Someone had the bad sense to go out and purchase another 40-some daffodils, 20 more species tulips and the last of the nectaroscordium at her local garden center the other day. (But I had been looking for the cute, short yellow tulip tarda... and the nectaroscordium is also called honey garlic. How could I resist something called honey garlic?!) With winter weather moving in and daylight fading fast, I'd best bundle up and get to it!